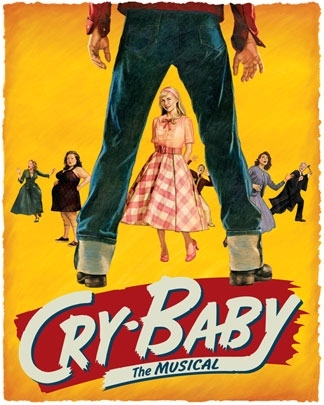 The Liberty Bell Drama Company presents “Cry Baby,” a musical based on the 1990 John Waters film with the same name. The musical focuses on Baltimore teenager Allison Vernon-Williams, who is drawn across the tracks from her 1954 finishing-school background into a relationship with the orphaned Wade “Cry-Baby” Walker, the leader of a pack of rebel outcasts. It’s 1954. Everyone likes Ike, nobody likes communism and Wade “Cry-Baby” Walker is the coolest boy in Baltimore. He’s a bad boy with a good cause – truth, justice and the pursuit of rock and roll. Cry-Baby and the square rich girl, Allison, are star-crossed lovers at the center of this world. Fueled by hormones and the new rhythms of rock and roll, she turns her back on her squeaky clean boyfriend, Baldwin, to become a “drape” (a Baltimore juvenile delinquent) and Cry-Baby’s moll. At the other end of the topsy-turvy moral meritocracy of 1954 America, Baldwin is the king of the squares and leads his close-harmony pals against the juvenile delinquents, who are ultimately arrested for arson, sending the drapes all off to prison. It’s Romeo and Juliet meets High School Hellcats.